There’s a problem about Hideout 125 Restaurant & Lounge, admittedly a happy one for owners Brian Shreffler and Panos Bourounis. Now that everyone is discovering its beguiling mix of comfy hospitality with worth-the-drive food – from hand-cut steaks through inventive small plates and the chef’s latest dessert with bacon to vintage cocktails, wines you don’t find just anyplace and well-chosen craft beers – everyone is going to be hiding out together. But, as the 125 in the name indicates (12-5-1933 is the date Prohibition was repealed, making it, Shreffler said, “the most important drinking day in American history” in addition to his birthday), we don’t need secrecy any more. Hideout 125 is on the leading edge of the fine dining and drinking wave on Fort Wayne’s north side, at least in response to the recent growth out there. Bourounis was already interested in the Dupont Road location when he started talking to Shreffler about it. 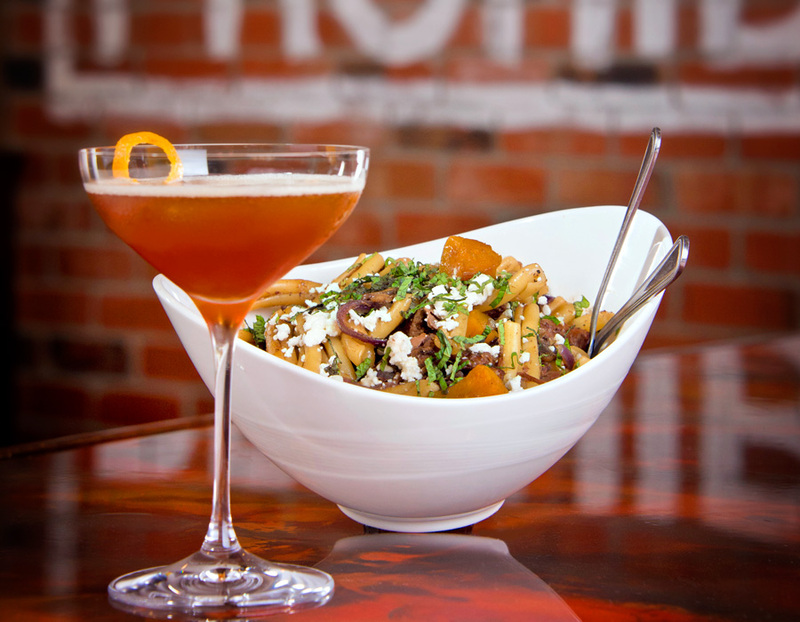 The two have given northern Fort Wayne a high concept, completely approachable and welcoming, fine-dining restaurant with a bar menu like nothing else in Fort Wayne, harkening back 100 years to the way cocktails used to be mixed. The menu ranges from beef and lamb to seafood and chicken with vegetarian options. On the menu, every appetizer, salad, soup, small plate, entree, dessert, whatever, has recommendations of a cocktail, a wine and a beer. It encourages experimentation, Shreffler said, and diners are discovering new favorites and rediscovering old ones. He has been delighted by how popular the Kale Salad has become. It features house-made dressing and croutons. “I did that for me, thinking it was going to be something I was going to have to take off the menu,” he said. “It’s a way to get people to eat a healthy, good-for-you green. I was pleasantly surprised. The beverage suggestions with the Kale Salad are the Moscow Mule cocktail, the Domaine Lafage Cote d’Est wine from France and Dogfish Head’s 61 Minute craft beer. If you order a Moscow Mule with your salad, it will be made fresh for you, but Hideout 125 offers six cocktails that are aging to perfection in little barrels behind the bar: Rusty Nail, Brooklyn, Old Fashioned, Martinez, Seven Year Itch (Shreffler’s homage to Marilyn Monroe) and Negroni. “I’m trying to figure out how to do a cocktail on tap,” he admitted. It is possible to offer wine on tap, and Hideout 125 was the first restaurant in town to offer wines that way, he said. “It’s absolutely the best way to serve wine, always the appropriate temperature, the way the winemaker wanted the wine to be,” he said. Customers tell him they’ve never had them taste so good. The entire menu is available on the website. Much of it stays the same, but seasonal changes are made, he said. For fall, the lamb entree is going seasonal with mushrooms, butternut squash, carmelized onions, pasta and a chiffonade of mint in a pan sauce with mascarpone. He’s adding a braised short ribs dish and a chicken-and-waffles dish, plus some seared scallops and a grilled bone-in New York strip steak and changing the walleye preparation.